Non Profit & Art Events Happening in August! A sparkling new riff on the 15th-century morality play The Summoning of Everyman by Branden Jacobs-Jenkins, whom the New York Times calls “one of this country’s most original and illuminating writers." A finalist for the 2018 Pulitzer Prize in Drama, Everybody is Cal Shakes’ second official offering under the New Classics Initiative (NCI), exploring what it means to be a classical theater in the 21st century, and to allow living writers to expand our classical canon. Directed by Nataki Garrett making her Cal Shakes debut, Everybody plays now through August 5 at the Bruns Amphitheater in Orinda. Tickets (ranging from $20‐$92) are available through the Cal Shakes Box Office at 510.548.9666 or by visiting www.calshakes.org. Ticket prices are subject to change without notice. The Jennifer Perlmutter Gallery is pleased to present "Surreal," which opens on August 2, 2018, featuring the work of Bay Area artist Tom Gehrig. The exhibit will also include works by Catherine Moore, Carol Aust, and sculpture by Southern California artist Emily Maddigan. In times when truth is stranger than fiction, and the daily news feels surreal, we look to art for understanding and perspective. Viewers will be delighted by this engaging exhibit of work, a tribute to surreal art. The exhibit is on view through September 1, 2018, with an artist's reception on August 2, from 6:00-8:00pm. The Lamorinda Arts Alliance presents a new exhibit titled “Plein Air to Imaginaire”. The participating artists have expanded the notation of landscape by exhibiting art that includes traditional scenes of hills and valleys to wild interpretation of landscape through color and texture. Free to attend. Diablo Ballet’s 8th Annual Gourmet Gallop food and wine walk returns to downtown Walnut Creek! Sip, Sample, and Stroll your way through Walnut Creek’s gourmet restaurants at Diablo Ballet’s 8th Annual Gourmet Gallop on August 9 from 6-9 p.m, sponsored by Diablo Magazine. 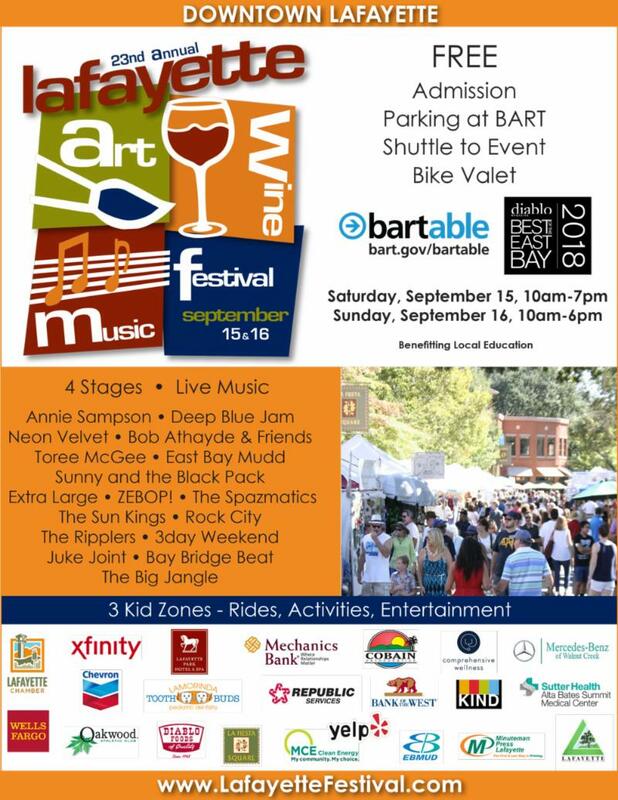 Check in at Massimo and make your way to eighteen downtown locations, including five wine tasting stops with wine provided by Darcie Kent Vineyards, Jacuzzi Family Vineyards, McGrail Vineyards and Wines, Rock Wall Wine Company and wine provided by Buon Vino. All proceeds benefit Diablo Ballet and its PEEK Outreach and PEEK Extension programs. Visit our website at www.diabloballet.org or call (925) 943-1175 to purchase tickets. Saint Mary’s College of California and the Saint Mary’s Alumni Association invite you to campus for an afternoon of wine tasting, delicious appetizers, and fun at the Soda Center. Proceeds from ticket sales and the silent auction support student scholarships at Saint Mary’s. 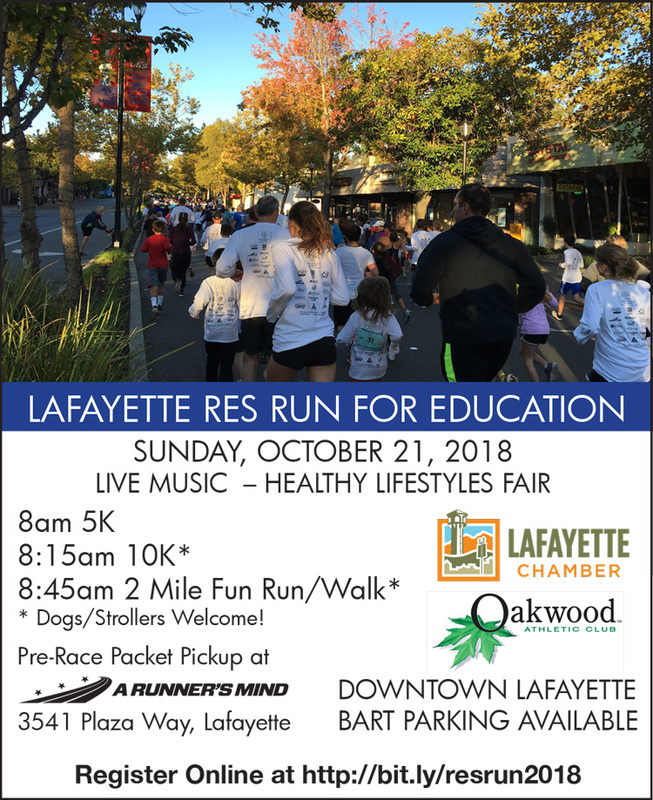 Captain Vineyards, a member of the Lafayette Chamber has been part of this event for 10 years! Ticket price includes SMC logo wine glass, appetizers, and wine tastings. Call (925) 631-8744 or visit stmarys-ca.edu/wine for tickets & information. $50 per person until August 1 ($60 thereafter; $70 at the door). $20 per designated driver includes appetizers, souvenir wine glass, and nonalcoholic beverages. Jim Breuner, besides being a CERT instructor, is a member of a large animal rescue team. He will speak about the challenges and methods of rescuing animals (both large and small) from dangerous situations. He will also cover preparing for disasters and evacuating with your animals. Click here to RSVP and let us know that you will be there. The NorCal Kids Triathlon is a sprint distance triathlon held annually in Orinda, CA. Kids ages 4 to 14 years are invited to participate in this fun event that encourages exercise in a fun environment. Offered for 2018 are individual divisions from ages 4 to 14 years old. There will not be a relay division this year. Learn more and register here. Every year, tens of thousands of teenagers struggle with thoughts of depression, deep sadness, isolation, suicide, stress and the feeling of helplessness. Sadly, and too often, the parents of these teens are the last to learn this, and sometimes too late to take action. However, today, there exist terrific resources in formats that teenagers can understand, to help them in multiple ways with these issues, while still allowing the teen to retain their much-needed dignity that they desire. A Brighter Day 3rd Annual Charity Appreciation Golf Event is a fundraiser for A Brighter Day. Register online at www.abrighterday.info. Join Local Food Adventures and Town Hall Theatre as we Eat, Tour and Talk About Theatre! 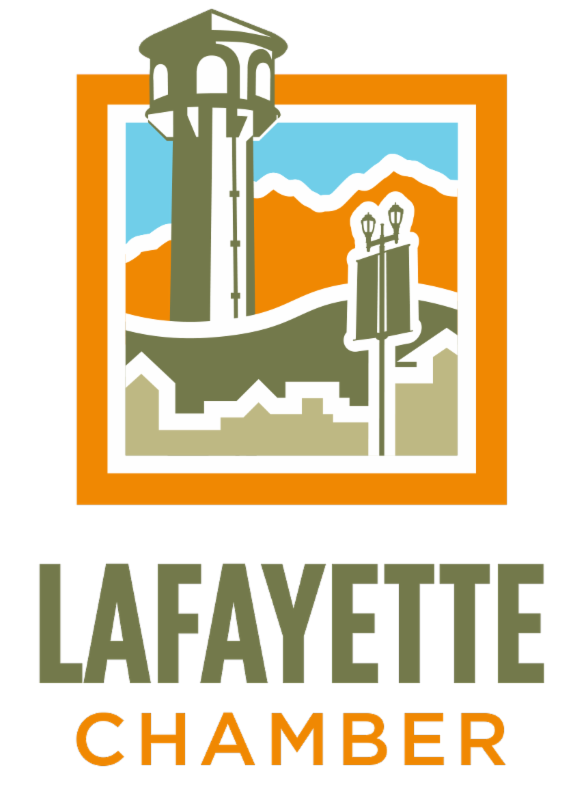 Lafayette Chamber member Lauren McCabe Herpich, founder of Local Food Adventures will guide you through a history of Town Hall Theatre and a special tasting of brioche dishes celebrating the upcoming production of The Revolutionists. Liliana Duque Pineiro, Scenic Designer for The Revolutionists. Ms. Pineiro will give us a sneak peak behind her exciting design for our season opener and share her historical inspiration. The set for this show is sure to get folks talking and you will be the first to hear why! Susan E. Evans, Director of The Revolutionists will discuss her vision for the show and give you some historical context of the four women depicted in the play as well as some background on the local playwright, Lauren Gunderson! Tickets: $50 Town Hall Theatre Subscribers/$55 non-subscribers. Purchase your tickets here. The Connected Horse program is based on research conducted through UC Davis School of Medicine and Center for Equine Health. FOREJOUR pays tribute to the music of 80's mega bands FOREIGNER & JOURNEY, recreating the soundtrack of a generation with stunning accuracy. Forejour’s set list includes the 20th century’s most down-loaded song, “Don’t Stop Believing”, as well as power ballads such as Foreigner’s “I Want To Know What Love Is”, and Journey’s “Faithfully”. Learn more and buy tickets here. Now this is going to be good! Mix up your mixing experience and grab a friend to join us for a beautiful summer afternoon at the Lafayette Reservoir. We will be located at the grassy field near the play structures. New people are always welcome! Dogs are welcome. Learn more and RSVP here.